Holy moly! What did I just read! So many twists and turns, a story that spans years and the ultimate second chance story... and boy oh boy that cliffhanger! I cannot wait for book 2 and 3, they’re going to epic! 4.0 out of 5 starsChemistry! Phew! The heat in this, wow! Poor Lia though, the things she has had to learn and than to have it all taken away......but I cant wait to find out how cruz was involved! This is the first book in a trilogy and wow what a fully packed little story this first book was. A food read. This series consist of 3 novellas and it keeps you at the edge of your seat trying to figure out what is going on. Ophelia Harris (aka Lia) was the First Lady who is now a widow with the death of her husband. She is still a possible target for the person/persons that killed her husband so when she departs the White House, she has secret service detail to protect her. The agent in charge happens to be someone Lia knows very well. Cruz, the agent in charge of Lia's security, and Lia had a romantic relationship in college but Lia moved on and got married when she thought that Cruz would never come back. They still have very strong feelings for each other but can't act on it. The attraction is so strong however that they finally can't resist each other. But we don't know what's going on and how is trying to hurt Lia and it seems that Cruz knows but won't tell. Lia is determined to find out! I can't wait to find out what happens next for Cruz and Lia and to see what is really going on! Great short story with a surprise cliffhanger! This was a fantastic start to this story. It’s short, amazing, and oh so hot. Lia and Cruz had a short relationship while they were in college. He had clearly said that he wasn't looking for anything just a night together. But the connection between Lia and Cruz couldn't be denied. But he left like he told her he would. Now he is back...to protect her from the person who killed her husband, who was the President of the United States. You can feel the chemistry coming off the pages from these two characters. A very explosive start to this series. Yes there is a cliffhanger but it’s manageable with not having to wait very long for the next installment. I can’t wait to see what happens next. From the start I knew this was going to be a great book. The more you read, the more in love you fall for Lia. Then wondering what will happen with Cruz. And they finally got it going on from all the tension in the air and then Eden Butler became a cliffhanger Queen. She included the college life with some First Lady to the President life after the death of her husband. What is Cruz up to? 5.0 out of 5 starsWOW!! A quick captivating read! This was a quick, intense, captivating read that will have you inhaling chapter after chapter until the very end. If you thought the chemistry between Lia and Cruz was explosive just wait until the bomb drops because that ending definitely has me begging for more and impatiently waiting for the next book! 5.0 out of 5 starsIntense beginning that features a ton of heat and desire! Eden Butler starts the Protocol series with a bang! I love that this is a very different kind of story. A love that is denied. A love that is forbidden. And all of this happening as the First Lady of the United States is suddenly a widow. We get the backstory as well when Lia and Cruz first meet in college, have a whirlwind romance and then part suddenly. As we are now in the present, of course when the former first lady now needs protection more than ever as she resumes her civilian life, who is assigned to her detail? The man who would forever be the love of her life. Wow. This little gem of a book does not hold back as Lia and Cruz are forced to be together again, all the while the man who killed the President is still on the loose. I like that this series is in 3 shorter segments and Butler does a great job in giving us everything we need without dragging the beginnings of this tale out. The heat between Cruz and Lia is insane and I know it's only a matter of time before they pick up right where they left off. I cannot wait for the 2nd book as the story heats up both in and out of the bedroom and secrets will most certainly be revealed. 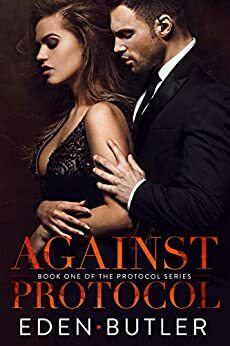 Really well done, I happily give Against Protocol a solid 5 stars!